Magnificent. Fascinating. Absorbing. Breathtaking. Titillating. Mind-blowing. These are just some of the superlatives that I could think of, after watching this masterpiece. It doesn’t happen to me often that a film keeps resonating in my mind and I’m still pondering about it after a while. Not that you have to be puzzled about the mathematical content, because it’s better to forget about that part. The theory of relativity is brought up once and a while, they end up somewhere in some fifth dimension and you’ll be bombarded with theories about black holes and wormholes till you get dizzy. There were some things not really clear to me, but I restrained myself to find plot holes or doubt the accuracy of some mathematical assumptions. It would be quite pretentious to doubt certain statements that are thought out by more enlightened spirits than myself. Although I kind of lacked some imagination in the past to understand certain axioms from solid geometry. So I still have difficulties with the proposition that “two parallel lines intersect with eachother at infinity.” Firstly, I can’t imagine the infinite. And second, those parallel lines will still be parallel even at infinite distance. No one on earth will ever claim that they do intersect there, because no one ever been at that infinite point and saw it with his own eyes. For me it was totally surreal mathematics, my limited intellect couldn’t grasp. Hence probably that’s why I flunked that exam of solid geometry. But that’s beside the point. Nolan managed to make an epic film. A mix of fiction and non-fiction. The set-up to establish a colony on an unknown planet in another galaxy (“To boldly go where no man has gone before” comes spontaneously to mind) is not really science fiction anymore, given at this time all preparations are made to try the same thing on Mars. But as they plunge into the wormhole, after which they’ll be teleported to another galaxy, the non-fiction ends and speculations begin. How it works, is demonstrated in a playful manner, using a sheet of paper and a pencil. Just to keep it simple for someone like me and explain it in an understandable way. But I have to admit that the visualization of this utopian trip looks stunning. As a counterpart of this high-tech future story, there’s also the human aspect whereby Cooper (Matthew McConaughey) has to make a difficult choice between his family and saving humanity. The space trip is preceded by the melodramatic part of the movie which I normally would have described as the corny sappy part. But here I didn’t have that feeling at all and the whole was brought well-founded. The sketched relationship between Cooper, Murph (Mackenzie Foy) and Tom (Timothée Chalamet) on the dusty ranch, is explained in detail and in a sound manner. In gloomy conditions they try to grow crops. A project that is doomed to fail because fungi slowly eats away all crops on our planet. Cooper, a former astronaut who was employed by NASA, focuses on the agricultural sector now (because there is a need for the production of food, and not space experts) and has constructed a fully automated farm. According to Murph there’s a so-called poltergeist who wants to deliver a message. Because of this phenomenon they discover a secret NASA complex run by John Brand (Michael Caine) who explains to Cooper his exodus theory and asks him to lead this exodus as pilot of the intergalactic spaceship “Endurance”. Usually the soundtrack of a film leaves me Siberian cold. But in “Interstellar” the composer Hans Zimmer created a perfect atmosphere with his compositions. Cooper leaving his family wouldn’t be so impressive with the supporting organ sounds missing. Knowing Nolan you can also assume that the appearance of the film would be impressive. And it is. The interior of the Endurance, the landscapes of the three planets, the images of infinite space, the black hole Gargantua, the presentation of the fifth dimension and the trip through the black hole. It all looked very impressive. Nolan is also known as a supporter of limited-use-of-CGI and it wouldn’t surprise me if they made use of huge settings interspersed with tiny elaborated scale models. The planet Miller I personally found the most successful and imaginary result. And finally I just like to mention the accompanying robots TARS and CASE. An innovative design with a humorous communication interface. What remains are the performances, with Matthew McConaughey as main figure. After seeing him at work in “The Lincoln Lawyer“, “Mud” and “Dallas Buyers Club” (for which he won an Oscar), you can only agree that McConaughey is a talented actor with a peculiar accent who leaves a mark on each film. Personally, I think “Interstellar” isn’t his most impressive rendition. Yes, he’s cut out for the emotion-rich family parts, but as an intellectual NASA astronaut I found him quite implausible. In contrast, I thought Jessica Chastain (as the adult Murph) and Anne Hathaway (daughter of Professor Brand) acted excellent. Casey Affleck (adult Tom), Topher Grace (Murph colleagues and for the umpteenth time in a fairly geeky role) and Matt Damon appear only briefly and each with a different important contribution. The only one who really should feel at home in this film is John Lithgow, for his participation in “3rd Rock from the Sun”. 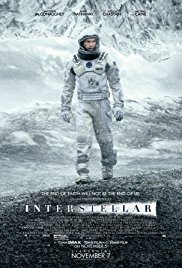 I could repeat the superlatives I wrote down at the beginning because despite some developments that went beyond my understanding and an ending I wasn’t impressed by, this is still a wonderful film that manages to blend both the scientific and the personal feelings of the protagonists perfectly. I’m still wondering who ultimately planted that wormhole near Saturn, that fifth dimension still goes over my head and how Cooper finally succeeded in sending the right information needed to Murph also seemed quite an achievement. And posturing about love as something scientific that knows no boundaries, was also an excuse to give it all a deeper philosophical tone. But ultimately, this is another SF that can be included in the gallery of all those other masterpieces. I loved it too, for once a science fiction voyage of discovery film, instead of special effects dominated, and good versus evil battle movies. The original Star Trek had the ocassional voyage of discovery episode. Interstaller left me with a sense of wonder about the universe. Looking forward to seeing it again when the DVD comes out. It has obvious comparisons to 2001.